Tofu is a cholesterol free soy product ....by itself it is bland , you can prepare them in any sauce with any fillings or toppings , deep fried or steamed , they will still taste delicious . A healthy and comfort food for those who are on soft diet. 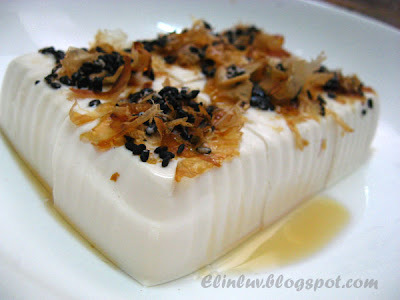 For today 's tofu dish , I wanted it simple and yet has a ' look east ' taste , so I steamed the tofu for 3 minutes , while still hot , garnish top with bonito flakes and black sesame seeds , drizzle sesame oil over the surface for extra oomphs and I can have this for snack. Easily digestible too ! Silken Tofu is an excellent source of vegetarian protein. Just for knowledge sake , one half cup ( 4 oz ) of raw firm tofu serving is about 10 grams of protein and the recommended protein intake daily is 56 grams for men and 46 grams for women. And tofu has low calories , the same one half cup raw tofu has only 5 grams of fat , 133 mg of calcium and 1.8 mg of iron . Tofu is a cholesterol free food so those who wants to diet... can consider adding tofu as one of your daily food :) But of course not every one is like me..some don't like tofu...Daddy doesn't fancy tofu but lucky my Piggies love tofu ! So, with three against one , tofu is served often ! 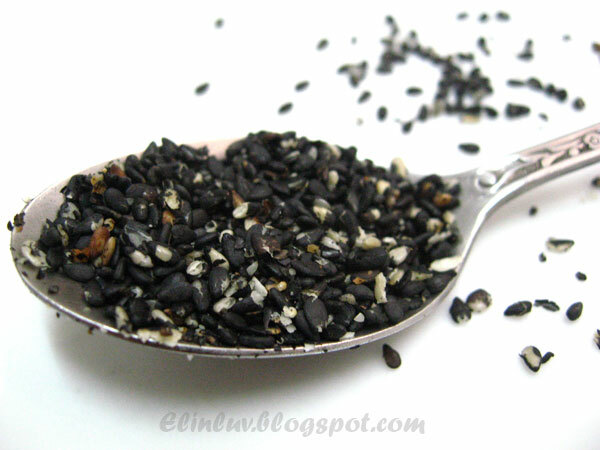 Black sesame seeds are high in calcium, iron, copper, magnesium, phosphorus. These minerals help to support healthy bones, muscles, blood, and nervous system. Copper strengthens blood vessels, joints, and bones, and is helpful in relieving arthritis. Magnesium supports vascular and respiratory health .It also contains zinc and calcium, which also improve bone health. They have a sweet and nutty flavor. I like to add them to my food and cakes :p love their nutty fragrance. 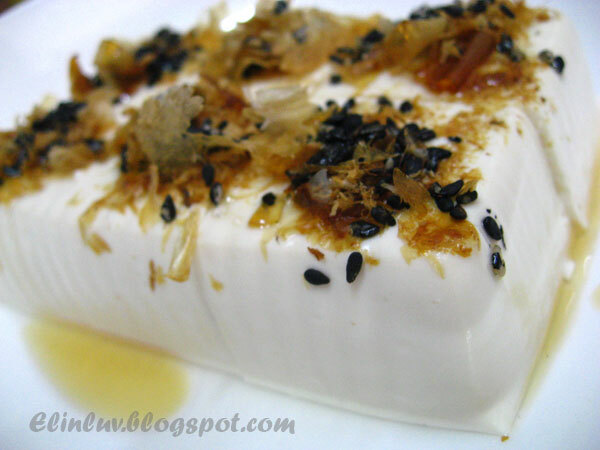 Rub sea salt over silken tofu . Steam at high heat for 3 minutes. 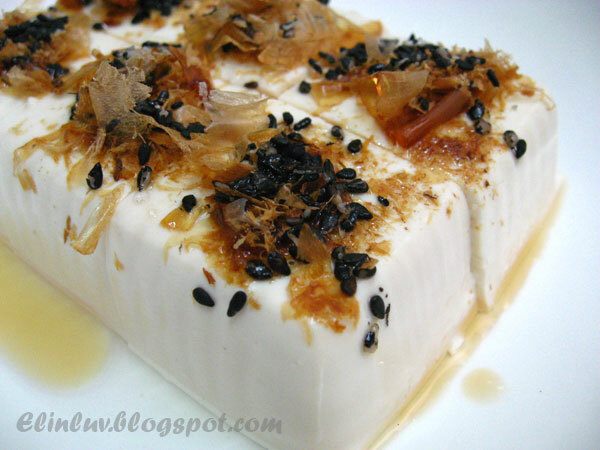 Take out tofu and drizzle hot sesame oil over the tofu and garnish with black sesame seeds and bonito. A very classy dish. Lovely presented. Love the use of the bonito flakes. What a creative, beautiful dish. I bet the saltiness is just what tofu needs. i love tofu, this is simple but delicious. Hey, this is very original, Elin! 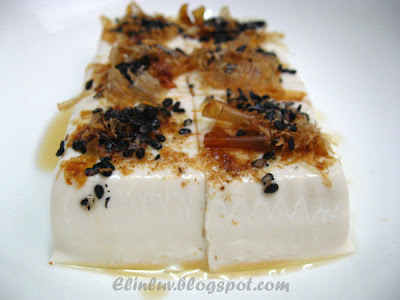 Tofu with black sesame seeds and bonito flakes. Never thought of using black sesame seeds this way, except for baking. Lovely clicks too! Beautifully presented. Thanks for all the tips and wonderful tofu recipes. I do like it but always have a hard time figuring it out how to prepare it so it isn't is bland.